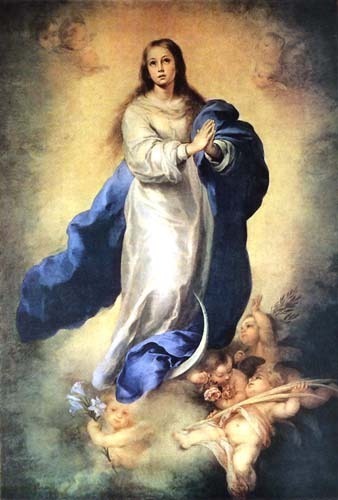 Among the many acclaimed and beloved representations of the Immaculate Conception shines the one painted by the 17th century Spanish artist Esteban Murillo. A very young and beautiful Virgin Mary effortlessly floats in the heavenly realm, her hands clasped in a gesture of devout prayer, her white tunic and blue mantle draped in graceful folds, moon sliver visible beneath her. Her face and eyes are directed upwards and her entire person is softly illuminated by the diffused nimbus of golden light. Rosy-cheeked, delighted and awed cherubs peep from among the puffy clouds at the corners and bottom of the image. It is a stunning vision of Our Lady, as artistically accomplished as it is rich in spiritual significance and devotional ardor. Simplicity and sweetness are found alongside a very complex theological charge. How do painters step up to an empty canvas and imagine a portrayal that becomes a religious and cultural treasure? Bartolome Esteban Murillo, Immaculate Conception of El Escorial, oil on canvas, 1660. By the time Murillo painted his celebrated version of the Immaculate Conception, Marian iconography has already reached great stability and maturity of expression. 16th and 17th century religious art abounds in representations of the Immaculate Conception that are compelling and easily identifiable. By 1649, Francisco Pacheco, Spanish painter, teacher, and critic, was already describing composition and palette guidelines for the portrayal of the Virgin Mary. When we look at a painting or a sculpture and recognize it as the Immaculate Conception, we take advantage of an inherited cultural and religious paradigms that came to be established over hundreds of years of reflection, prayer, and intense iconographic search. From the inspiration found in the Gospels to the 2nd century’s proto-Evangelium of James to the prayer books found in the monasteries of Egypt and Greece, to the artworks in the ancient churches of Rome, from Medieval scriptoria to Shrines, ideas and images of Mary prepared the way for the 1854 dogmatic teaching on the Immaculate Conception. Francisco de Zurbaran, Immaculate Conception, oil on canvas, 1630. A consistent study of Marian iconography has been carried out with some rigor only since the middle of the 20th century. The scholarly investigations in this area look for the dynamics between artistic techniques, creative processes, material representation, and religious belief that helped establish recognizable and normative representations of the Blessed Virgin Mary. For this reason and in addition to art historical and cultural knowledge, studies in Marian iconography also generate something akin to a paradigm for creating works in the religious and sacred art genre that can be an authentic visual counterpart to the intellectual and spiritual content of the Faith. The story of artistic landmarks in Marian representation begins with the pious legend about the Evangelist Luke who, under the inspiration of the Holy Spirit, painted Our Lady, seated with the Child on her knee. This legendary painting was carried out on a wooden panel. Based on common knowledge about the use of pigments in Greek art, we can only assume that St. Luke, who was Greek, veered towards chromaticity for the image that was likely to be rich and intense. The Mother and Child modelling believed to have been represented by St. Luke formalized into what is generally termed the Theotokos representation of the Virgin Mary. It has become a staple of the way Our Lady was and continues to be portrayed in religious art. The seated and formalized image of the Mother of God establishes a privileged, singular and intentional role of Our Lady in God’s plan and is a complement to the Gospel narratives. In later Antiquity, especially between 6th and 9th centuries, the representation of Mary’s Motherhood was further elaborated. She is also Maria Regina – a Queen. Maria Regina composition is a centrally painted Virgin, seated on a throne, with the Child on her lap. Very often, she wears regalia of the period – for example, she might be shown as a Byzantine empress. However, despite the historicism of her dress, she is always shown in an ahistorical reality. Namely, she is not bound by time or specific geographic place. The throne is painted as if it were floating and her entourage is usually made up of Angels. She is shown as Mother and Queen ab aeterno. Trastevere Madonna, 6th - 8th century. The commissions for solemn images of Maria Regina and Theotokos after the 3rd century were intended for official building sites, such as churches and monasteries, a finding which demonstrates that cult of the Virgin was widespread by that time and that Lady’s iconography was familiar and important to the faithful. The earliest surviving image of Mary, Mother of God from before the Edict of Milan is found in the Catacombs of Priscilla in Rome and dates from about 150 AD. Another corresponding example of an ancient Marian icon of the Regina genus is also found and venerated in Rome, in Trastevere under the title of Madonna della Clemenza. It is a Maria Regina composition with two angels standing behind the throne and a kneeling, though now due to material deterioration hardly discernible, figure of Pope John VII (705-707) at Our Lady’s feet. It was painted on a wood panel in a well-known encaustic technique that has origins both in ancient Egypt, Greece, and the Christian East. In early Medieval period, the diffusion of Marian iconography continued to accrue momentum through the work of illuminators and scribes. Lambeth Bible (XII c.) and New Winchester manuscript from England (X c.) are both wonderful and artistically consummate examples that can be counted among landmarks of Marian depiction. The Lambeth illumination shows the Tree of Jesse tracing Mary’s royal descent from Jesse and David. It is a lovely, vibrant drawing with lavish colors, gilded detailing and a very central figure of the Virgin Mary. Her role in the dynastic economy of Jesse family tree is being reaffirmed here. The Winchester manuscript contains an amazing ink on paper drawing from the Benedictine Abbey in New Winchester showing Our Lady actively listening in on the conversation amongst the haloed Divine Persons. The crown atop Mary’s head and Holy Spirit depicted as Dove hovering above it are both visual allusions to Mary’s perpetual Virginity. Her active participation in the plan of Redemption is affirmed by the inclusion of defeated Satan, and two vulnerable figures with a history of epic failures: Judas the Traitor and Arius the Heretic. The Trinity is imagined in a decorative studded circular framing representing the heavenly realm and a semi-circular arch as throne, possibly symbolizing the world. Our Lady is drawn standing, differentiated from the Trinity by her posture and the crown. Tree of Jesse, Lambeth Bible, XII c.
The Middle Ages witnessed an increasing urgency with the observance of the December 8th Feast. First mention of an official celebration in the West dates from the 9th century Milan, but the presence of earlier art and prayers suggest that their history began much earlier. These early celebrations were localized geographically and also tied to specific monastic orders. Towards the end of the 15th century, mainly to assuage the erupting disputes, Pope Sixtus IV ordered two Offices to be composed for the December 8th celebrations. Both texts are decisively Immaculist and mark the beginning of a search for an official visual representation of the teachings therein. Together with the 1480 text by the Franciscan Bernardino De’Busti, a commission was made for an Immaculate Conception altarpiece. This first official artwork had a rather complex history and perhaps very few people realize that the Madonna of the Rocks in the Louvre is Leonardo Da Vinci’s Immaculate Conception. The story of the visual representation of the Virgin Mary begins with her portrayal as the Mother of God and culminates in her image as the Apocalyptic Woman in the works of the 17th century masters. 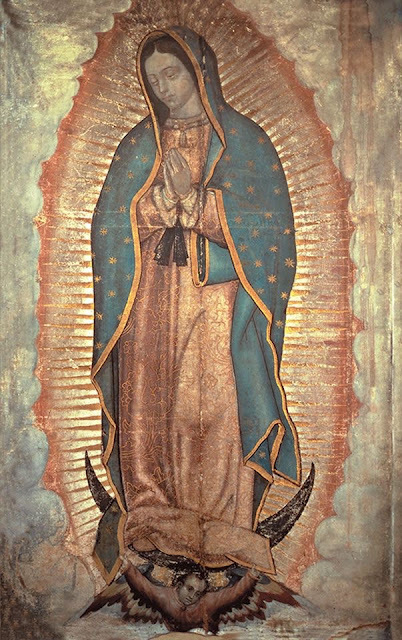 The acclaimed and the lesser known paintings and statues are crowned by a different sort of masterpiece - the miraculous tilma image of Our Lady of Guadalupe, the acheiropotos (not-painted-by-the-human-hand), dating back to the early 16th century Mexico. A young and beautiful Mary, hovers on the cloud, her splendid tunic and glorious mantle arrayed elegantly about her person, an angel peeping beneath her shoes. She is the Immaculate Conception of St. Juan Diego and the Americas. Our Lady of Guadalupe. Early XVI c.
Kinga Lipinska is an art consultant specializing in religious art, heritage restoration, and church renovation planning. Her background is in art history, philosophy, and theology. Since 2001, she has been employed by Talleres de Arte Granda, a liturgical arts workshop from Spain.